Clockface Beauty are a natural, organic and vegan beauty brand based in the heart of the Yorkshire countryside. They’re extremely passionate about clear, honest labelling on beauty products and are keen to promote the value of “me time”, meaning all of their products are very simple, yet luxurious and – most importantly – effective. I have been using this morning and night for two weeks so far, and I’m so impressed with how it is leaving my skin feeling rejuvenated and glowy even in the dull, cold weather! It’s very light, absorbs easily and quickly (which is very handy in the morning!) and smells divine; it has a primarily earthy scent thanks to the frankincense and myrrh, but is lifted by light floral notes of ylang ylang… I usually hate the smell of frankincense, so I’m surprised at how much I love the smell of this serum, but I really do! It also contains plenty of skin loving nutrients and oils including vitamin E, jojoba, avocado, grapeseed and argan oil, which all help to hydrate and heal the skin while preventing against future damage. 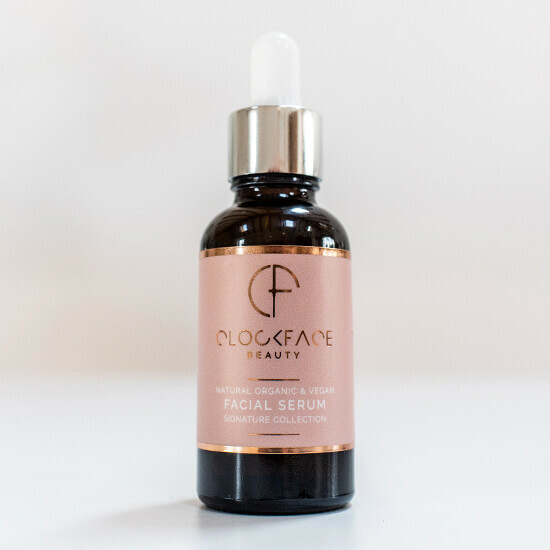 I have thoroughly enjoyed this serum and would absolutely recommend it; it’s particularly fantastic as it’s suitable for all ages and skin types! Perfect for the cold weather and with a nourishing blend of oils (including calendula, sweet almond, apricot, moringa, argan and jasmine), this roll-on oil has been a little lifesaver for my cuticles! Its powerful, targeted formula means the results are super quick; I even saw visible improvements to my dry cuticles overnight after just one use. I’ve really love this product, particularly in the roll-on format as it’s so easy to apply and handy when you’re on the go! I also find it really therapeutic and relaxing to use on my hands before bed, thanks to the scent of rose otto. As well as this 10ml roll-on, this oil is also available in a 30ml dropper bottle for £25. Overall, I’ve been incredibly impressed with Clockface Beauty… I love their beautiful packaging, the simplicity of their formulas and particularly the fact that the brand was founded by two fellow Yorkshire ladies! They also have an extensive range for men, which seems to be something of a rarity among green beauty brands. I’d definitely recommend the products I’ve tried so far and am keen to try more in future! Have you tried Clockface Beauty? If so, what did you think? Let me know in the comments below! Please note: These products were gifted to me for review by the brand. Regardless, my review remains completely honest based on my own experience of using them. See my Disclosure page for more information. It is such a lovely brand! Glad you enjoyed the post!